As Winter market opens, let's have fun together and visit all the stalls! 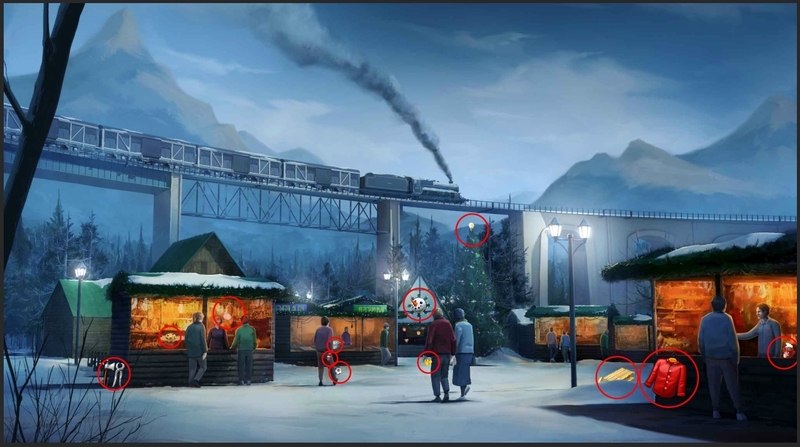 Can you find all 12 goods or winter resources? 12 familiar or freshly introduced goods are hidden in the image above. Can you find them all? You can mark the goods in the image, or write a list of 12 items as your answer. 6 random players with the correct answer will be rewarded with 200 Gold each. If you want to participate in the prize draw, please remember to mention the name of your game world where the prize can be sent. By participating you agree that we can publish the winning avatar names on the forum. Lots of luck and have great fun visiting the winter market! All 12 items circled in the attached image! I play 102 and we do not have the new goods so the names are a guess. Unable to find any info online for them also. Well, let's see, what I could find. At least, as I am not a serious person, I found 14. Group B "Freshly introduced". Those are goods I found in the German forum game. so they are introduced today ... yes, that's what I would call fresh. 2. The chocolate chops cookie, my fav cookies. 4. The glove ... well, he holds the other hand deep in his pocket, like he does already on the station seen on lobby background. I doubt that left hand is gloved too. 10. The sleigh There should be some kids around taking posession of it. 12. The cup of cappuchino ... or is it a goblet full of mulled wine? 13. He is holding a dead white mouse, and as I got a new mouse for my computer 2 days ago, mice count as freshly invented too... for me. 14. Snow. Happened here yesterday, a bit of it at least, a fresh invention after summer, so it should also count. There is a rule in the German forum game, that members are allowed to take part in only one language of the same forum game. This made sense in the past, when the challenges were the same. This time, they overlap, but the challenges/games are different, the prizes are different and the time is different. So, please, Samisu, I took part in both games. I guess that's ok with different games running at overlapping times. If not ... I like the English game much more, it's more fun, more creative, more a challenge. So, if the bosses think that German rule also counts for different games running on the same day ... I would prefer to be in the English game, not in the German game. The post was edited 4 times, last by Klabbauter ( Dec 7th 2018 ). Bonus Good: Although the graphic is not there, one could argue there is a 13th good (shoes) in several locations.